Are you wondering how to prep up for an upcoming hotel interview? Sure, you’ve dressed smartly and cleaned up nicely, but are you ready to wow the interviewer? 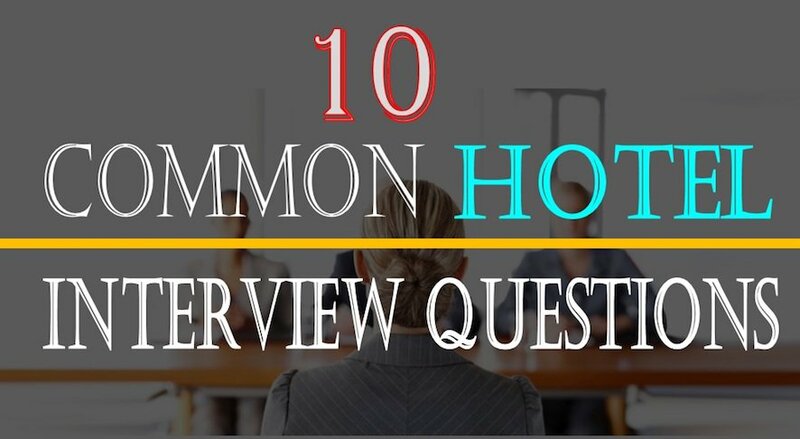 In this post, we have listed 10 common hotel interview questions with tips to answer them properly. If you are a fresher, it’s even better to have a pen and paper handy to make notes to help you construct from what you take from this post. It so happens that the best way to ace hotel interviews is to get familiar with questions the interviewer might throw at you. So, you already have a perfect resume carved and if not here’s a guide to get your Perfect resume for the hospitality industry. While this article contains questions more suitable for Hotel industry freshers, the questions are equally important and relatable to all positions. Now, we’ll walk you through 10 common hotel interview questions with tips to answer them effectively and with ease. Let’s begin. Sound simple and straightforward, right? While this common interview question is open-ended, you don’t have to bore the interviewer with lots of info. This question might be asked in different ways like walk me through your CV, or in some other ways. However, this question always acts like an icebreaker. So, give your best and be yourself. This article by CNBC gives definitive guidelines on how to answer when asked, Tell me about yourself. Turns out, what the interviewer is looking for is a 2-minute snapshot of who you are and why you think you’re the best fit for the job. It’s not about telling your life story — well unless it’ll add substance to your pitch. Be to the point and tailor your answer to the job you are applying for. The recruiters want to know about you, your interests and your background to check if you would be the right fit for the role you are applying for. 2. Have you dealt with an unhappy or difficult customer? If yes, how did you handle the situation? Customer service is at the epicentre of every hotel business, and angry/unhappy/ demanding customers are bound to come your way. The trick is to tell the recruiter how you’ll turn the unhappy customer into a repeat customer. Service in the Hotel industry is the most important success factor. By this question, the recruiter would like to know how you can handle pressure and how can you manipulate the situation to your advantage. You need a lot of persuasive skills and positive attitude towards handling a difficult situation. Through this question, you are being assessed for the soft skills that you have or that can be honed in the future. The hotel industry is full of examples when it comes to unhappy customers. However, they are your biggest source of learning as has been rightly quoted by Bill Gates. So through this question, the interviewer would like to know your learning through the episode when you came across a really difficult customer. If you have not come across any such situation as you might be a hotel management fresher, you should not be afraid of speaking the truth. Simply mention that there is no such instance which is worth mentioning. However, you must support your answer with an instance that you saw someone else tackling an unhappy customer and what were your learning out of that situation. A vivid explanation of the same would definitely earn you a few good brownie points. Simply mentioning, the question is just about how you handle a challenging situation in whatever way it may be asked. Here’s a quick video to explain this super common hotel interview question and the guidelines to answer the same. 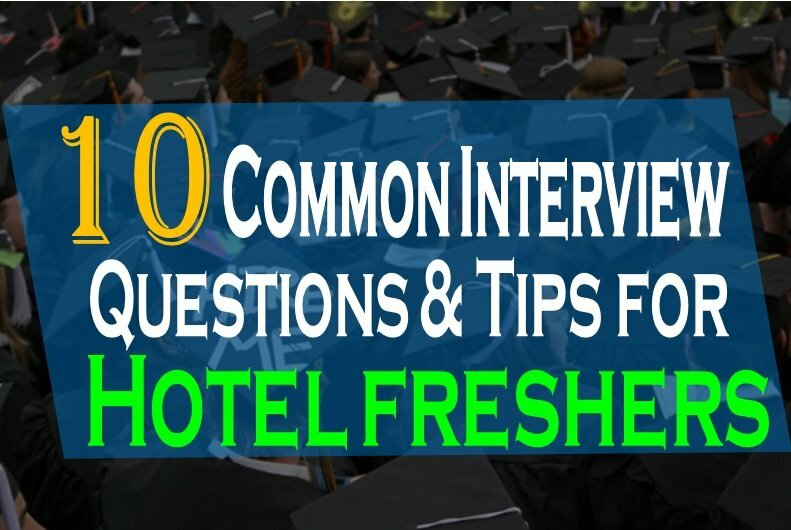 This is probably one of the most common hotel interview questions for freshers. The employer would like to see your enthusiasm here and not the details. The answer would show if you are a keen learner, enthusiastic and positive in your attitude. For one, the hotel wants to bring on board someone who’s genuinely interested in working there, and for the long-term. It is extremely important to know of the intangibles here. the scripted answers of career advancement, better prospects etc. don’t work to your advantage. Show your enthusiasm, preparation regarding the culture of your hotel employer, your possible contribution and so on. A lot of similar hospitality related questions are mentioned in our definitive guide to Hospitality Interview Questions with answers. 4. Do you have any experience working in a hotel? Yes, the hotel employer already has your CV and if you are a fresher he/she know that you only have an industrial experience to boast of. But, they want to hear from you on how you can take out positives from whatever experience you have and that too in a nutshell. Regardless of the position, you are being interviewed for; this is one of the common hotel interview questions you should expect. As a fresher, mention that while you have not worked in a hotel, you have gained some experience working as an intern or in a restaurant. Then use this question to quickly explain how you felt comfortable during your internship and what makes your short experience during internship worthwhile. Add a few smiles while you answer this question and the recruiter would be pleased to see the hospitality traits in you. 5. Is your schedule flexible? This is a question which is almost a certainty at some point in time for the interviews of almost all hotel industry professionals, especially for freshers. Unfortunately, the nature of almost all the hospitality jobs is such that you might need to have a super flexible schedule. It’s not uncommon for hotel employees to work seven straight days a week during busy season. On the flip side, you might have a relaxed outing to your workplace during the lean season. So, flexibility drives you ahead of your competition if you fancy a great career in the hotel industry. But, then this a trick that is being used by everyone. So, the recruiter knows this already. If you have little experience, you should speak the bitter truth. That makes you sound honest and true to yourself. Even the hotel management freshers can speak the truth in a modest way. Just don’t mention a weakness that can cause a conflict with your direct job description. 7. Where do you see yourself in one, two or five years’ time? Here’s one of the most common hotel interview questions that can make or break your interview. This is one of the most hotel interview questions for freshers. Ideally, you should envision yourself having gone through the ranks after five years or so working there. This question that is asked during most of the hotel interviews wants to test your intentions on your stability. If you have been a job hopper, then this question becomes even more important. Again, it is important, to be honest with yourself and your recruiter. Don’t just mention that this is a dream job and you will stay here for the next 10 years. Also, never answer that ‘I want to be in your chair in 5 years’. This is an answer that has been repeated millions of times and can bore your recruiter to death. So, please be authentic. The Hotel industry sees one of the biggest churning of the workforce with people switching jobs too frequently. So, if you can prove your stability while answering this question, you are sure to move through to the next round. Probably, this is a make or break question in the interviews of hotel industry jobs. Here’s an article that answers in detail this extremely important question- Where do you see yourself in 5 years. Here’s another opportunity to answer why and how you are the best fit for this job. Just don’t forget that the interviewer is looking for a job and hotel-related strength. The rules to answer this question are similar to the one for weakness. Be authentic, don’t brag and keep it relatable to your job description. Keep the answer short to 2 minutes or less and only elaborate on each strength when asked. In the hotel industry, Freshers at times get too engrossed in self-bragging while answering this question and lose the sight of time. This is the question you have prepared for the most and you are happy when this gets fired to you. Yes, you are free to be positive while answering this but keep it simple, crisp and short. As a fresher, a stable head and modesty will help you cross the line when the competition is tough. So, go for this question about your Greatest Strengths, but with lots of modesty and truthfulness ingrained in the answer. Or, simply said, be balanced in answering this question. Make your answer all about the hotel. Share information that only meets all the criteria the hotel is looking for. Speak about the tangibles and intangibles. Speak about how you would add value and what makes you the best fit for this hotel and this job. Check our other article on Tips to become a great hotelier which might help you match your own skills that you already possess and other skills you can develop that will help you thrive within the hotel industry. This question, if asked in the early stages of the interview, should contain the snapshot of your greatest strengths. If you have already spoken of the greatest strengths during the process of your interview, this question is an opportunity to build on that answer. This again is one of the most common hotel interview questions for all positions. For Fresher, you might not have enough opportunity to dictate terms as the budgets are normally fixed. However, with those with some experience in hand, this is an extremely important question. You need to have a proper understanding of the salary range of the hotel industry for the job position you are being interviewed for. You would also need to be reasonable with your expectations. You can’t go low and you can’t go too high. It’s always better to hear the budget range first from the interviewer. Expecting a reasonable hike from last drawn salary is perfectly natural as well. We have mentioned further details in our article on Tips for Salary Negotiation in the hospitality industry. Here you go. Some of the most common questions that you might be asked during your hotel interview. If you are fresher, preparing these interview questions immaculately helps in settling the interview blues. Prepare yourself well and get on with the interview with a clear head. Check our resource on Preparing for your interview at the hotel in person or on Skype. Prepare hard, and if you have these common questions already ready, the interview should be much more fun.